Used as the first stage of defense on the iSpring whole house water filtration system, the first filter is a 5-micron high-capacity polypropylene sediment filter. 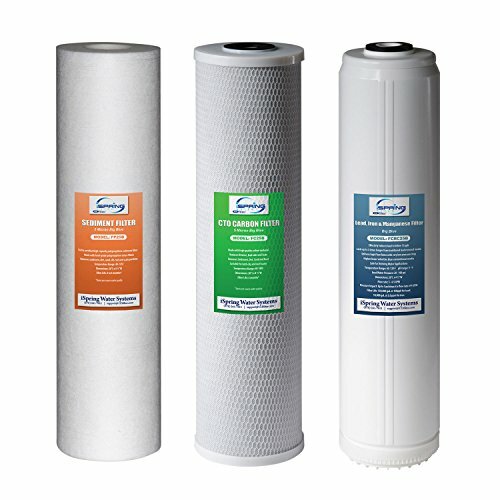 This filter removes dirt and other various larger sized particles from the water that can clog the following filters. The second filter is a 5-micron CTO coconut shell carbon block filter. Block carbon is more effective than other forms of carbon in that it is finely ground up carbon packed into a solidified block. This means they have a higher density than other types of carbon filters, and are therefore more effective in removing their targeted contaminants. The carbon block filter knocks out bad tastes and odors, removes over 90% of chlorine from the water, and is highly effective on organic chemicals (VOCs) like pesticides, herbicides, and industrial chemicals. The third filter is an iron and lead reducing filter. The FCRC25B iron and lead reducing filter is only included with the WGB32B-PB, as it is not needed for most municipal water supplies that the WGB32B targets. CTO Carbon Block filters use high quality coconut shell carbon for maximum filtration efficiency and filter life, tested by independent third-party to meet NSF/ANSI Standard. Lead removal cartridge (FCRC25B) reduces lead, iron and metallic tastes in drinking water.